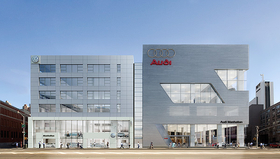 VW and Audi's new New York stores, shown in a rendering here, are part of a plan to increase U.S. sales. Volkswagen Group of America Thursday signed an agreement to buy the Potamkin family's flagship dealership in Manhattan and convert it into VW and Audi dealerships. VW confirmed plans to buy the store at 11th Avenue and 56th Street from Potamkin Auto Group. The building currently houses Potamkin GM, which has Cadillac, Chevrolet, Buick, GMC, Hummer and Saab franchises. The Potamkins are moving the six franchises five blocks south on 11th Avenue into a smaller store that housed Potamkin Honda, said Robert Potamkin, who owns the Potamkin Auto Group with his brother Alan. Potamkin said VW will spend about $125 million for the property, with about a third of that going toward renovation of the site. The Honda franchise has been sold to Giuffre Auto Group in the Brooklyn borough of New York City. Giuffre owns Mazda, Hyundai, Kia and Mitsubishi dealerships. Potamkin GM sells about 1,500 new vehicles annually, said Robert Potamkin. The Honda store's sales are about 3,000 new vehicles annually. The Volkswagen and Audi stores will be run by the Open Road Auto Group, which currently owns an Audi dealership in Manhattan as well as BMW, Mini, Nissan, Mazda, Acura and Volkswagen stores in New York and New Jersey. The new VW store is expected to open next spring and the Audi store in late 2011. Both will have new showroom concepts for the brands. The new stores are part of VW's “aggressive plan to increase sales in the U.S.,” VW of America President Stefan Jacoby said in a statement. “There is no better place to demonstrate our commitment than in New York City,” he said. The Potamkins bought the 56th Street building from General Motors in 1979 and opened Manhattan Cadillac. In 1987, Potamkin returned the franchise to GM, which recruited Roger Penske to run the store. In 1991, the franchise was returned to the Potamkin family. “We talked about different alternatives and showed them the smaller and more efficient building, and they are very happy,” he said. Potamkin said the GM store will reopen at the new location Monday, Nov. 16.